Home to scenic areas such as the Whiteshell and Nopiming Provincial Parks, this predominantly Canadian Shield region is full of lakes, rivers and wild mixed forests. From family-oriented fishing trips to isolated excursions off the beaten path, the Eastern region offers it all. A multitude of distinct topographies define this territory, with a mixture of fringe land, deep boreal forests, Canadian Shield escarments, provincial parks and an excess of sizeable waterways. The Eastern Region displays a perfect blend of prime habitats for various species and popular hunting experiences. 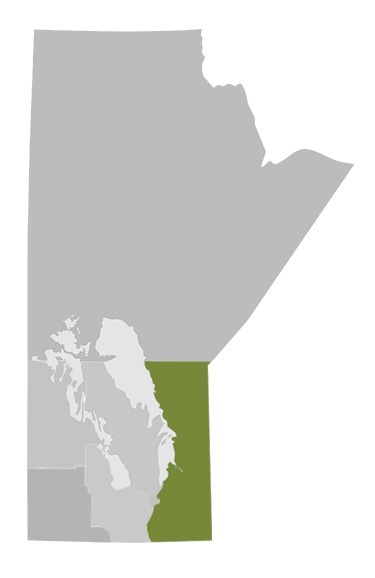 Widely considered as one of the top black bear destinations in North America, Manitoba continually emerges as a preferred choice for thousands of devoted bear hunters! Home to wild turkeys, grouse, partridge and ptarmigan, Manitoba offers an excellent opportunity for a multi-species game bird experience! Manitoba offers a variety of select areas for exceptional moose hunting opportunities with many setting impressive examples for one of Canada’s biggest antlered animals! Manitoba’s whitetail offers one of the most diverse hunting experiences available and is well known for producing massive dark antlers and often tipping the scales at 250 pounds!